﻿﻿﻿ Audiobook now on iTunes, ACX and Audible! Click here to listen to a sample. ​Also available in paperback and on Kindle! Horsewoman and freelance writer Ann Campanella moves back to North Carolina after being away from her family for several years. 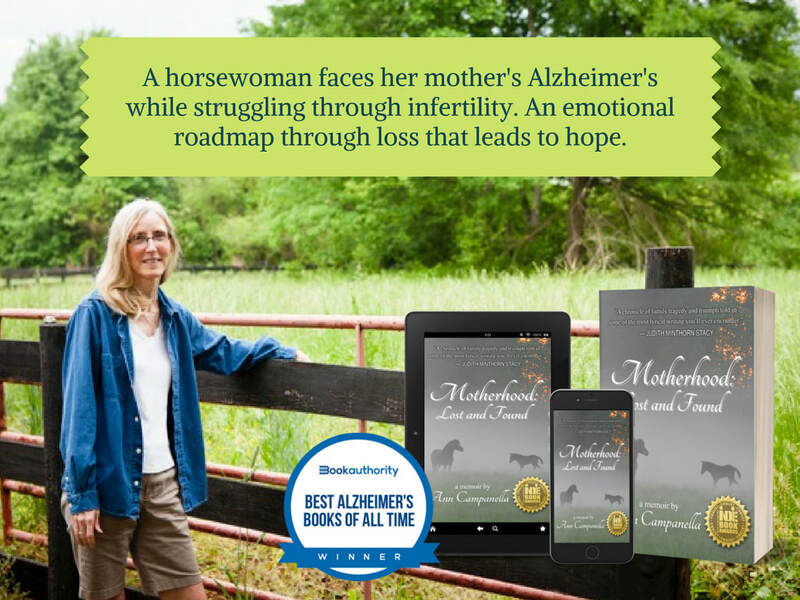 Ready to start a family, Ann’s foundation is shaken when she experiences multiple miscarriages at the same time her mother, who lives on the opposite side of the state, begins showing signs of Alzheimer’s. As her mother’s illness progresses and Ann’s window of potential motherhood begins to close, she finds comfort in her horse Crimson and gradually gains a deeper understanding of what it means to love and live fully. For more information, click on Books and Reviews. Most bookstore chains can order this memoir. ​The Beach Poems now available! "Reading Ann Campanella's The Beach Poems is like pressing a conch shell to one's ear and listening to the sound of waves," says Poet Terri Kirby Erickson. For more info, see The Beach Poems under "Books" tab.